The winters feel like they keep getting colder. We’re only at the start of February and we’ve already had lots of snowfall, icy mornings and battles with the wind. And if last year’s anything to go on we’ve got a good few beasts and blizzards to make it through before we emerge into the summer heatwave. So the house thermostat gets increasingly higher (apart from when the other half keeps sneaking in to turn it a few degrees lower) and the number on the heating bill keeps creeping up. Well now one retailer has given us the perfect solution to keep up all warm and toasty however long this newest cold snap lasts. High-street store Argos has released a hot water bottle that’s different to any other you may have used before. 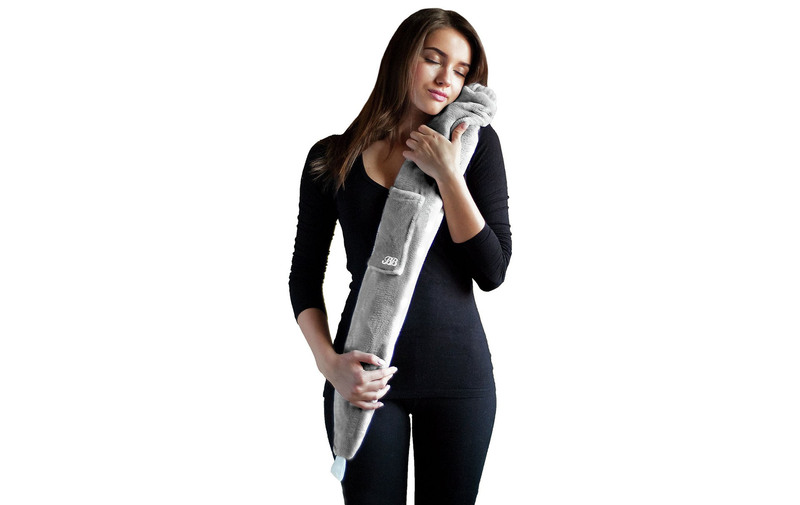 Like the name suggests, their Body Hot Water Bottle is designed to keep your whole body warm, rather than just a small area. While a normal hot water bottle typically measures around 35cm in length, Argos’s genius product is more than double that usual length at 75cm long! It also comes with a wearable strap so that you can tie it onto yourself to keep you comfortably toasty, rather than having to awkwardly position it in a way that it will stay in place. You can wear the clever bottle however you want to, but Argos suggest three smart ways you can use it to keep you warm. Pop it around your neck and nestle into it, tie it around your stomach to keep your midriff snug, or if you want full-body protection from the arctic conditions outside, position the bottle across your whole body and tie it from one shoulder to the opposite hip. You can get the bottle in a plain grey colour or a polka design if you want something a bit more fun and it is said to stay warm for six hours with less than a kettle of water. It’s available on the Argos website and in stores across the country for £24.99 – but we expect they’ll be swept up pretty quickly when the next snow forecast is out!